Last year St. Paul’s Church celebrated its fiftieth year in the Hackett Boulevard building. Some parishioners have wondered why there are so few items from the previous church in this 1966 building. Today we discuss one item from the Lancaster Street Church that could not be incorporated into the new building, and how it came to be preserved and protected for future generations. When St. Paul’s vestry met on September 12, 1962 with William F. Meyers, New York State’s Assistant Commissioner of Housing, he told them that they would have three years before the building was demolished. It was to be a far shorter time. Because St. Paul’s property (church, parish house and rectory) were in the area designated for the South Mall’s central air conditioning and main transformer vault, the demolition had to occur early in the mall’s construction. In May 1964 the vestry was told that they would have to vacate the building by the end of August of that year. After some negotiation, the congregation agreed to hold their last service in the building on July 26, 1964. That same day, ground was broken for the Hackett Boulevard building. Father Nelson Parke had passionately argued for the value of the many memorials in the Lancaster Street building. 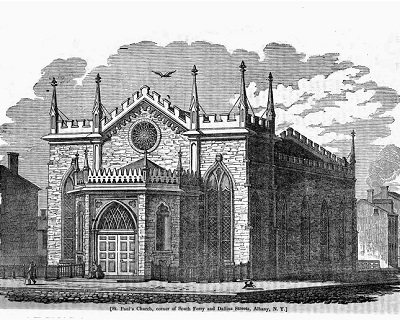 And Grace Gunderson, a member of the Temporary State Commission on the Capital City (the organization that was planning the South Mall), had proposed “to save and move the sanctuary and memorial objects such as the stained glass windows, and build a new church around them.” The vestry had to quickly determine which objects from the Lancaster Street building could be moved to the Hackett Boulevard church. A dozen of the stained glass windows from the Lancaster Street building would be placed in the new church’s narthex. Room was also found for brass plaques honoring Harry Van Allen and those who lost their lives in World War II. Many items from the chapel could be used in the new building; many other memorials would be buried under the new altar. The solution, however left a large number of other objects which could not be used in the new building. All of these objects were the property of New York State, which had taken the entire church by eminent domain on March 27, 1962. The State sold fifty-five lots of items at auction held in the last days of July 1964, including smaller stained glass windows, pews, paintings and doors. Lot number 44 “Pulpit – decorative sold oak” went to the Champlain Conference of the Wesleyan Methodist Church for $13.00. The pulpit had originally been donated in 1883 by Robert Geer, in memory of his two wives: Mary Sophie Gere (1837 – 1868) and Rhoda Kellogg Shed (1837 – 1882). Robert Geer was born in Ledyard, Connecticut in 1837. He worked as a druggist in Norwich, Connecticut, then in Syracuse, New York. In 1865, he moved to Albany, where he represented the Salt Company of Onondaga, in which his first wife’s family played a prominent role. In Albany, Robert Geer was also president of the Board of Trade and served as a bank director. In 1883, six months after the death of his second wife, Robert Geer wrote a confidential letter to St. Paul’s vestry, explaining that during her last year Rhoda S. Geer had “several times expressed the wish that some one would place a new memorial pulpit in St. Paul’s Church.” Both women had been confirmed at St. Paul’s and were communicants of the congregation. Having consulted with the rector, J. Livingston Reese, Geer commissioned the pulpit in memory of his wives, and asked the vestry’s permission to place it in the church. From church records, we know that work was designed by Robert W. Gibson, architect of All Saints’ Cathedral, and designer of the pulpit in St. Peter’s Church. The pulpit was executed by Annesley & Co., the Albany firm that also made the bishop’s throne at the Cathedral of All Saints. The Geer memorial pulpit remained in place in the Lancaster Street building for the next 81 years, but its future in summer of 1964 was far from certain. If the pulpit was not claimed by the Wesleyan Methodists before demolition began, it would become the property of the demolition contractor, to be disposed of as the contractor saw fit. Flick formally requested that the pulpit be preserved, and transferred to the collection of the State Department of Education. General Schuyler responded positively the next day, and within the week, arrangements had been made to remove the pulpit from the church and place it in the Department of Education warehouse at 1260 Broadway. If it had not been for Hugh M. Flick’s intervention, the pulpit might have permanently left the city of Albany, or might even have been destroyed. It is certainly a impressive piece of furniture: almost seven feet from base to top of the lectern, and monumental in scale. But it must have been the angels that impressed Flick. Each figure is carved in fine detail, with very distinctive features, as though each were based upon a real individual. How did Flick recognize it as the work of Camillo Kramer? We have been unable to locate any further documentation from the State Education Department, though I have not yet checked Hugh M. Flick’s correspondence from this period. I have been unable to find other examples of Kramer’s work, but Flick was too careful a historian to make an attribution without some evidence. Camillo Kramer was born in Prussia in 1846, and emigrated to the United States about 1870, settling first in New York City. He must have trained as a wood carver in Germany, because that is the first occupation listed in city directories. Kramer came to Cohoes about 1877, working as a carver for a furniture manufacturer. He came to Albany in 1882, the year our pulpit was built. He does not appear in business listings for several years, and we assume that he was working for other firms, possibly including Annesley. He established a shop at 8 Green Street (on the corner of Beaver Street) in 1888. That first year he is listed as a wood carver, but by the next year he had switched to another line of business: bicycles. Kramer sold bicycles and tricycles in the Green Street shop from 1889 until 1891. By 1893 he was back to wood carving, the occupation he continued until his retirement in 1912. Camillo Craver was not only a craftsman. Even as a young man in Cohoes he obtained a patent for a table, and over his lifetime was granted other patents for a velocipede, velocipede wheels, a pipe wrench, and a shoe fastener. This entry was posted in Demolition, Lancaster Street Building on March 17, 2017 by Paul Nance.